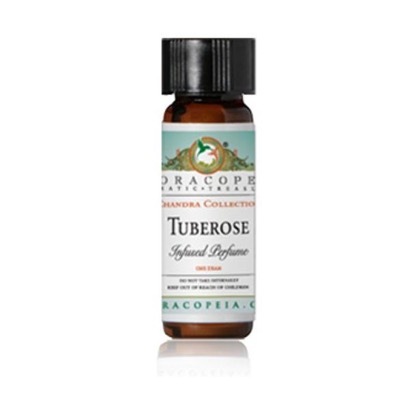 This natural perfume captures the unique fragrance of the tropical treasure of tuberose. Tuberose Infused Perfume is part of Floracopeia's Chandra Collection, a unique offering of the finest pure Tuberose absolute and 100% pure, organic Jojoba. Tuberose offers a rich, deep and soft floral fragrance. Perfect and exotic on its own, it can also be used as a base note when combined with other softer fragrances such as jasmine. Natural Perfume at an affordable price. This Natural Perfume line features some of the worlds most exotic floral absolutes preserved in a base of jojoba oil. Perfect for direct application these lovely perfumes can be applied any time you wish to annoint yourself.